Into the Future! The Making of Beyond Cyberpunk! The gestation and birth of Beyond Cyberpunk! 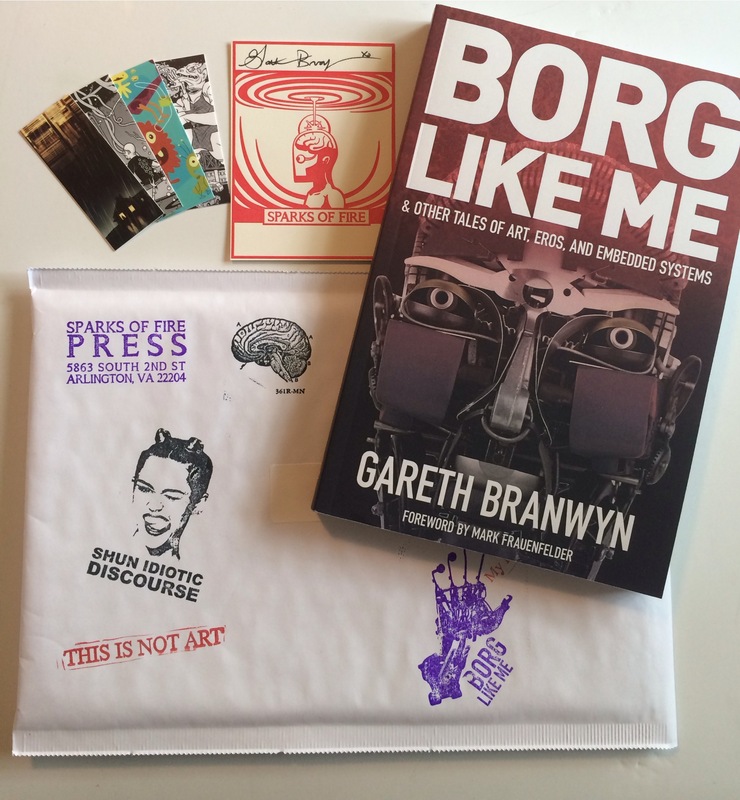 and Borg Like Me as narrated by Gareth Branwyn. What is the use of a book, thought Alice, without pictures or conversation. When Apple Computer released its HyperCard program in 1987, the computer world scratched its read/write head, not quite sure what to make of it. The computer press struggled to explain (“It's a graphical database program,” “It's an alternative to the Mac desktop,” "It's a software construction kit.”). Consumers were intrigued but largely clueless as to how to use the program. We were told it was easy to use, easy to program, and that it could magically link together text, images, and sounds into something called "hypermedia." 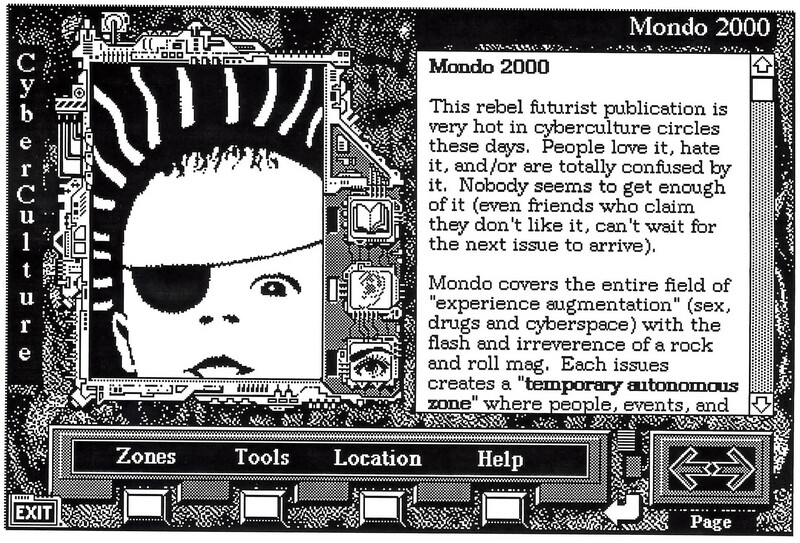 In today's world of a ubiquitous, multimedia-rich web content, what HyperCard heralded seems painfully obvious, but at the time, it didn't click for most people. There was little frame of reference, the technology was years ahead of its time. I got my first inkling of the potential for HyperCard/hypermedia in 1989 when a floppy disk arrived in the mail from my good friend Peter Sugarman, then living in rural Virginia. The disk had a chunky-bit, digitized picture of Peter, in a particularly pensive pose, on the laser-printed label. At the time, even a digitized photo on a disk label was kind of fancy. Booting up the HyperCard document (called a "stack" in the program's parlance), I discovered more pictures of Peter and his family and a map of Virginia that made goofy sounds and there was a little animated guy skulking throughout. I found myself peering at some weird hybrid media, a cross between an interactive letter, a family photo album, and a whimsical stroll through an eccentric friend's mind. While it was obvious that Peter was basically digitally doodling, testing out the capabilities of this new medium, I found its potential very exciting. At the time, I was running a monthly salon in the DC area, called Cafe Gaga,. The purpose of these gatherings was to send a group of people, from different professions and viewpoints, on fun journies deep into some theme or idea or to go on some sort of quest. Some events were experiential, arty, others more cerebral. The credo of the group was "art, information, noise." Each event was supposed to have some component of art, information (data, science, the exposition of an idea), and of course, everything generates noise. When I saw Peter's HyperCard stack, I immediately thought of how this technology could be used to create little "salons" on disk. After several weeks of blathering to others about this, someone sent me a stack in the mail called Passing Notes. It was exactly what I was talking about, a broadly-cast conversation that threaded its way through art, science, religion, and philosophy, all grappling with a single idea (in this case, the question "Are we more than the science that explains us?"). The stack even had a link to an online bulletin board (BBS) so that you could add to the conversation and see what others thought about the stack and the question it posed. Again, this all sounds like ancient history as counted in computer years, but back in 1989, this was real eye-opening stuff. Peter and I began having regular phone conversations about hypermedia and how it might change the nature of storytelling, media delivery, and information organization and navigation. I'd always been struck by cyberneticist Gregory Bateson's idea of forever being mindful to balance "rigor and imagination" in one's pursuit of knowledge. It seemed to Peter and me that hypermedia provided a perfect environment to pursue ideas deeply and rigorously, while engineering in fun, whimsy, and a sense of the unexpected—a kind of orchestrated chaos, a vibrant little media ecology. We began kicking around ideas for a collaborative HyperCard project we could do together. While Peter and I were anxious to get our hands dirty with hypermedia, I discovered a rather exhaustive list of cyberpunk sci-fi novels on The Well BBS and thought that might be a perfect subject for our stack. I'd been reading as much of this sci-fi subgenre of near-future worlds and high-tech low-lifes as I could get my hands on, so it was perfect fit. The idea was originally to create a "data bucket" into which we could just toss all of the information on cyberpunk that we found while surfing the Net. But, like a lot of hypermedia projects, once we started seeding our little pocket universe, Beyond Cyberpunk! quickly began teeming with lots of unexpected life. We soon decided to go all out, to make it as exhaustive as possible, and release it as a commercial product. 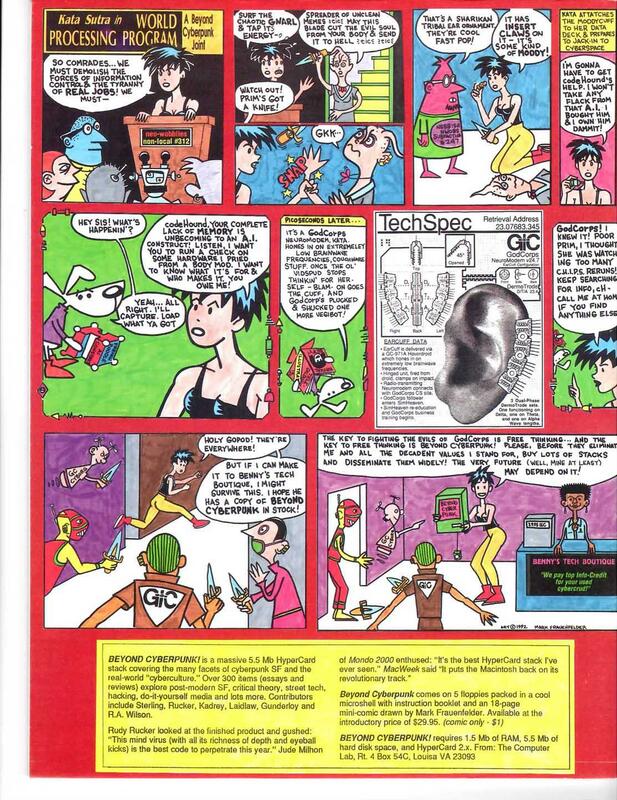 At the time (1990), the Internet was not yet in the media spotlight. So-called cyberculture (where these near-future speculative worlds met the bleeding edge of real-life technoculture) was in its heyday, but known only on the cultural fringes. We could sense that all things "cyber" were about to bust into the mainstream and we wanted to chart the course cyberculture had taken, from its sci-fi and early hacker roots, through the Internet, and soon, we suspected, into everyday, mainstream life. The project quickly mushroomed. I began talking to Mark Frauenfelder of bOING bOING about it and he got very excited. My email inbox (a rather quiet and lonely place back in 1990) and fax machine began to light up at all hours with Mark sending book and film reviews and ideas for other things we might include. Peter and I would eventually joke about the fact that, in the beginning, we weren't even sure how serious we were about BCP until Mark jumped onboard, started taking it seriously, and we thought: “OK, I guess we're doing this for real — we have another contributor who assumes it's real!” I soon also approached the brilliant Silicon Valley interface designer Jim Leftwich, whom I also met on the Well, and convinced him to sign on to this quickly expanding project, for no money. As we began publicly discussing our plans for the project on The Well and elsewhere, we started attracting some amazing contributors. Somehow, fearlessly approaching a well-known writer or luminary seemed so much easier on the long end of an email message. We sent mail to many of the founders of the cyberpunk genre and were actually shocked to get enthusiastic encouragement and contributions from Bruce Sterling, Rudy Rucker, Richard Kadrey, Marc Laidlaw, Paul DiFillipo, and Stephen Brown. We also received contributions from Robert Anton Wilson, RU Sirius, Hakim Bey, Joan Gordon, Steve Jackson, Steve Roberts (the “high-tech nomad), and others. The process of working on BCP creatively invigorated all of us. We'd work late into the night, each in our own home offices, Peter and I in two different Virginia locations, and Mark and Jim in two California locations. We'd trade content and stack demos via email and our faxes machines would come alive at all hours, sputtering out some new icons sketches from Jim, some new page designs from Peter, cartoons from Mark, or dialog or essay drafts from me. Peter was the creative force behind the stack architecture and programming, and I was in charge of the content. With the untold number of hours it took to program BCP, Peter learned every eccentricity, fudge, and nuance of HyperTalk, the scripting language that HyperCard spoke, and he applied what he learned brilliantly. I still hear from people how in awe they were of the cleverness of his scripts and the way BCP was all put together. Before BCP, Peter and I had done a lot of talking and note-taking on what makes good digital interface design. We even thought at one point we might do a book, or at least an instructive HyperCard stack, on the subject. We applied these ideas (many of them Peter's) to BCP and it seemed to pay off. Another aspect of BCP that was very innovative for its time was the full use of sounds and animations in concert with the written content and pop-up texts, graphics, and whimsical events. The stack was narrated throughout by Kata Sutra (voiced by my late wife, Pam Bricker). Every time you went to a new section, hit a glossary link, or triggered an error message, Kata would tell you where you were going, or would playfully chastise you (“Achtung, Chucko!”) for screwing up. Again, Peter earns the credit for his brilliant use of sounds and events to create a sense that the stack was a giant, clanking, well-meaning, but goofy data-contraption all held together with chewing gum and bailing wire and threatening to exhaust itself at any moment. In fact, there were a couple of special “chaos events” that could be triggered and the stack would fall apart. On the Survival Research Labs card, for instance, if you hit a certain sequence of buttons, the stack would emit the ungodly sounds of a machine taking its last dying breaths. With metal clanking and springs a-sproinging, chunks of the stack would fall off the screen, its wiry guts spilling out in the process. To accomplish this impressive feat – no small potatoes with 1991 consumer computer technology – Jim Leftwich laser printed and glued the card onto foamcore, cut out the breaky bits out, and animated the destruction photo-frame-by-frame with real wires and springs spewing forth from beneath the foamcore. It was extraordinarily funky, but still awesome. It worked, and people flipped out when they saw it. 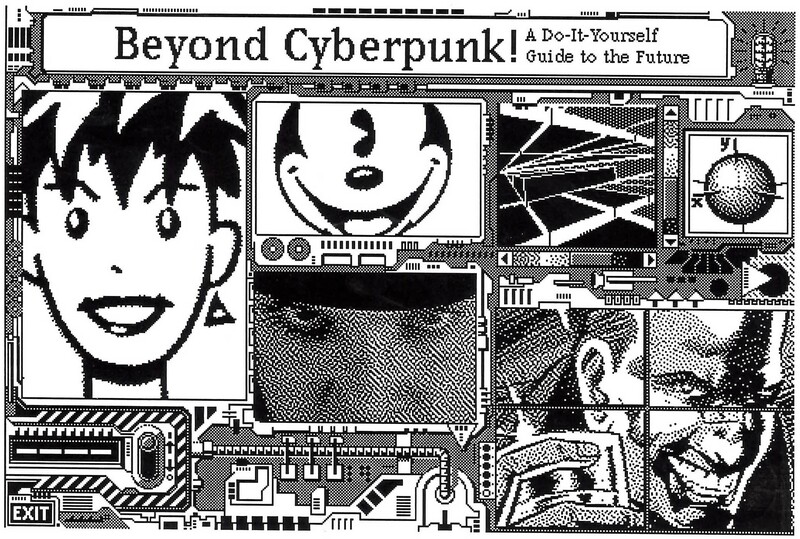 There was an exuberance and sense of humor in Beyond Cyberpunk!, along with a slightly askew, grubby street tech aesthetic, that made it seem old, alive, and greater than the sum of its parts. The subtitle for BCP was “A Do-It-Yourself Guide to the Future.” We sometimes also used “A Cut and Paste Manifesto.” The idea was to create this giant data bucket, loosely wire some of the contents together through hypermedia links, and then let the users create their own connections, drawing from that bucket the information and ideas that best suited them. 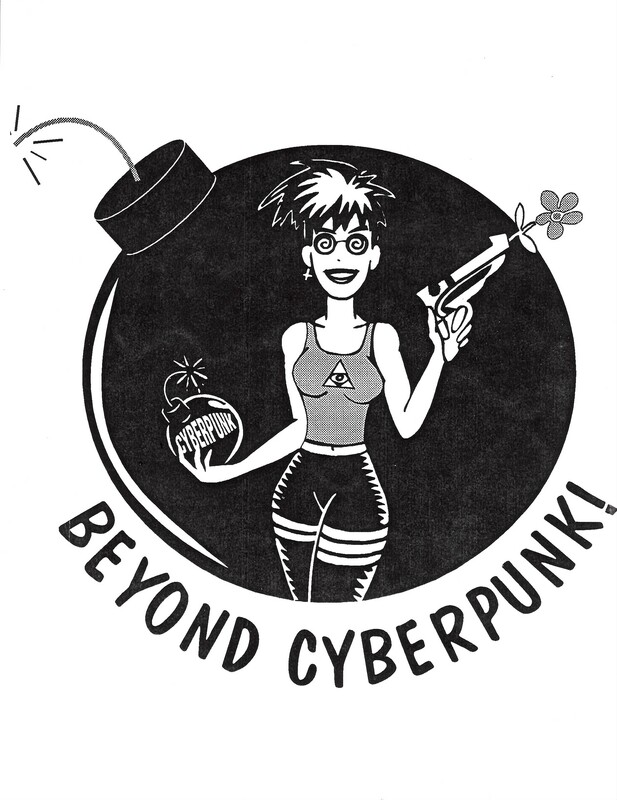 So, what exactly was contained within Beyond Cyberpunk! and how did it work? The main program, which was released on November 14, 1991, was a 5.5mb HyperCard stack. It came as a compressed self-extracting archive on five 3.5” floppy disks. The black disks had embossed silver and black labels on them and came in a clear Lucite box with a silver and black booklet. You also got a 20-page Kata Sutra in Beyond Cyberpunk! mini-comic with art by Mark Frauenfelder and text by Mark and myself. Kata Sutra, a character Mark originally created for bOING bOING, was a punky, fiery-tempered “fractal anarchist” who lurked amongst the pages of the zine, usually thinking of elaborately outrageous reasons why readers should subscribe. When she saw the fun the rest of us where having over at BCP, she couldn't resist ingratiating herself into the stack's multimedia “cards.” She brought with her a new character Mark created (and I helped write), an opportunistic data-retrieving AI with a K9 personality and a nose for mischief, known as codeHound. With their rather rough-shod, chaotic, but endearing personalities (with tongues always close to their cheeks), Kata and codeHound were in many ways cartoon expressions of the four of us. 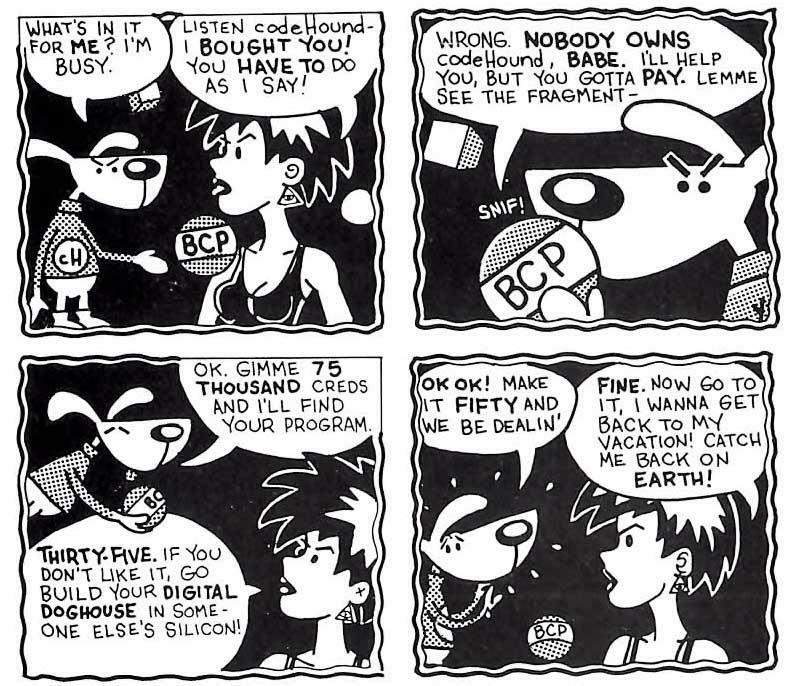 Kata became the voice of BCP and haunted the stack via text pop-ups, audio statements, and Director animations (which had her zooming across the screen on a circuit-board-encrusted hover-disk designed by Jim Leftwich). All the statements and animations were programmed into the stack as random events or triggered by set sequences of user's actions. Beyond Cyberpunk! was divided into four zones: Manifestos, Media, Street Tech, and Cyberculture. Each zone contained essays, reviews, artwork, animations, and sounds. There were over 600 “cards,” over 300 articles, 122 different sound clips, 19 animations, and 35 text pop-ups. There was also a glossary with vocal pronunciations, and a 1000-word hyperlinked index. Each zone in BCP had a series of essays followed by a resource section (books, magazines, zines, organizations, etc.) associated with the theme of that zone. 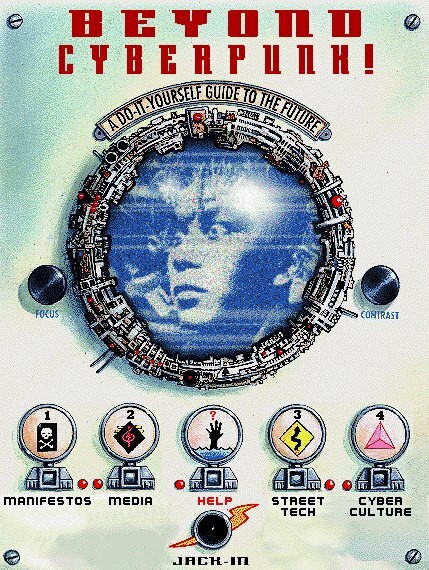 Manifestos covered higher-ordered thinking around cyberpunk fiction and cyberculture and looked at things like the political ramifications of the genre and its relationship to the post-modern thought/critical theory of the time. Media was the heart of the stack and explored hundreds of books, movies, comics – mainline cyberpunk science fiction. Street Tech looked at real-world hacker culture, media hacking tools, and pirate media. And finally, Cyberculture looked at art, music, fashion, and modern primitivism. 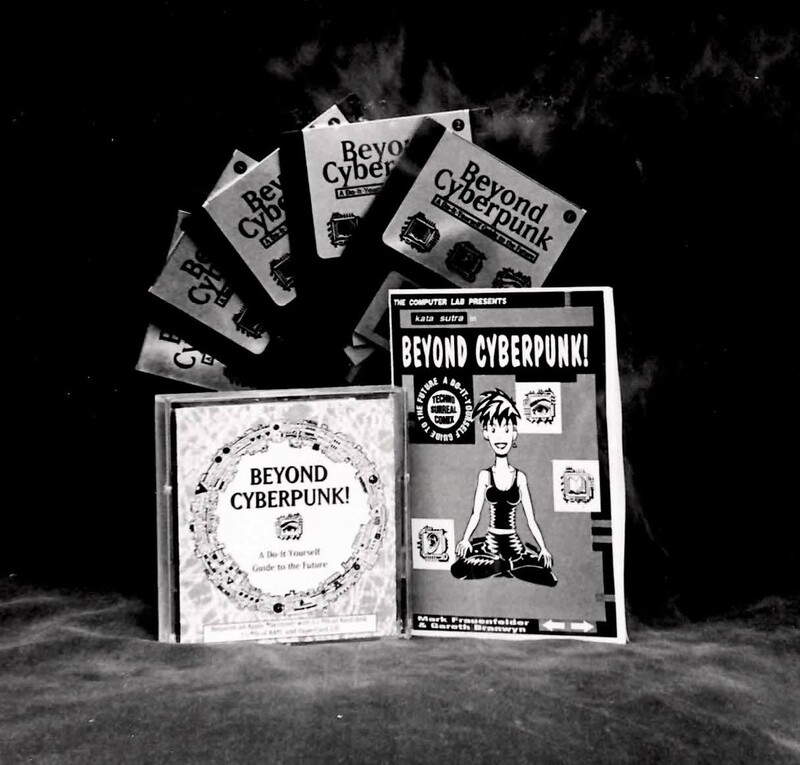 In 1993, we released a one-disk follow-up called the Beyond Cyberpunk! Update Stack with the subtitle: “What happened to the future since the last time we talked?” This release provided us with an opportunity to assess where cyberpunk/cyberculture had gone since the release of BCP proper and it was the first time I'd had an opportunity to tell my side of the Billy Idol story (see “The Internet is Punk Rock!” chapter in Borg Like Me). It also contained a bizarre and beautiful interactive art piece by Darick Chamberlin (author of the infamous cyberpunk novel, Cigarette Boy). Dubbed “The Blipvert Zone,” it was a dynamically-assembled collage of art, text, sounds, and narration done in the same Burroughsian “mock machine epic” style as Cigarette Boy. 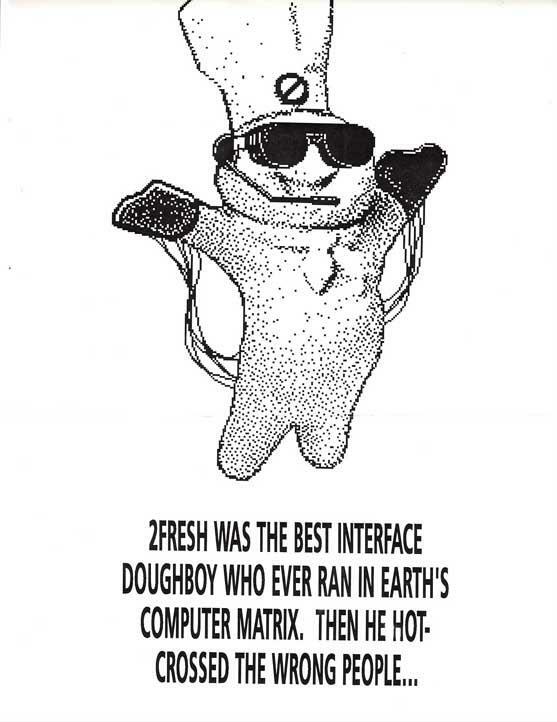 It's the the second annual CyberArts Festival in Pasadena, California, November 1991. Peter, Mark, myself, and several other contributors meet and shake hands literally in front of the program as it merrily gurgles and chugs through its cyber-industrial soundtrack. Mark and I, and Mark and Peter, are meeting face-to-face for the first time. We've spent hundreds of hours working together in a virtual computer lab, and now we've gathered in Pasadena to dine on the fruits of our labors. Beyond Cyberpunk! has been chosen as a featured exhibit for the CyberArts Gallery. We're munching on hunks of stinky cheese and sipping wine while proudly showing off our digital baby to the world. We meet the Mondo 2000 staff, and some of the future staff of Wired (who are showing off a preview of the magazine on a portable video player). We show BCP to Timothy Leary, Dwayne Goettel of Skinny Puppy, and other members of the cyberatti. Italian astrophysicist and musician Dr. Fiorella Terenzi bends down to watch the stack on its tiny 9” Mac screen for awhile, then looks up in amazement: “It's the future, no?” That statement becomes an oft-repeated phrase for the rest of the weekend and beyond. We're immediately struck by the sight of our low-budget, indie project alongside expensively produced, commercial multimedia programs. 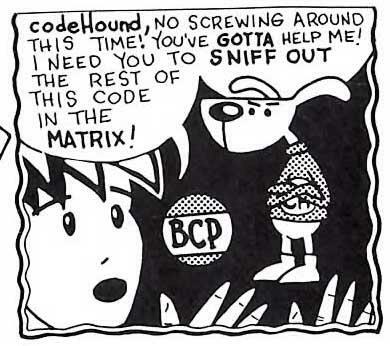 BCP looks humble and unassuming on its little black-and-white SE screen, but as soon as people start playing with it, they're drawn into its dense, engaging content, its irreverent humor, and its startling, periodic "chaos events." 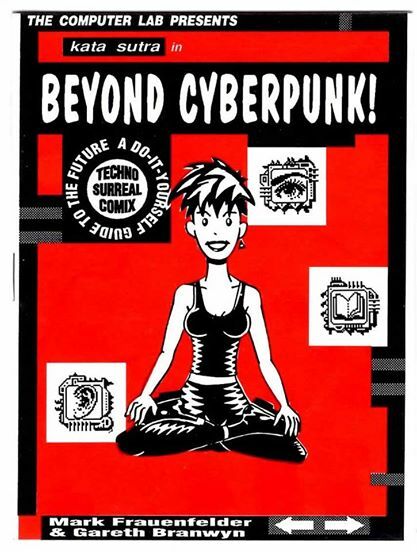 In the months that followed, the critical acclaim for Beyond Cyberpunk! was overwhelming. It received positive reviews in MacWeek, MacWorld, TidBITS, Mondo 2000, even the New York Times and Newsweek. 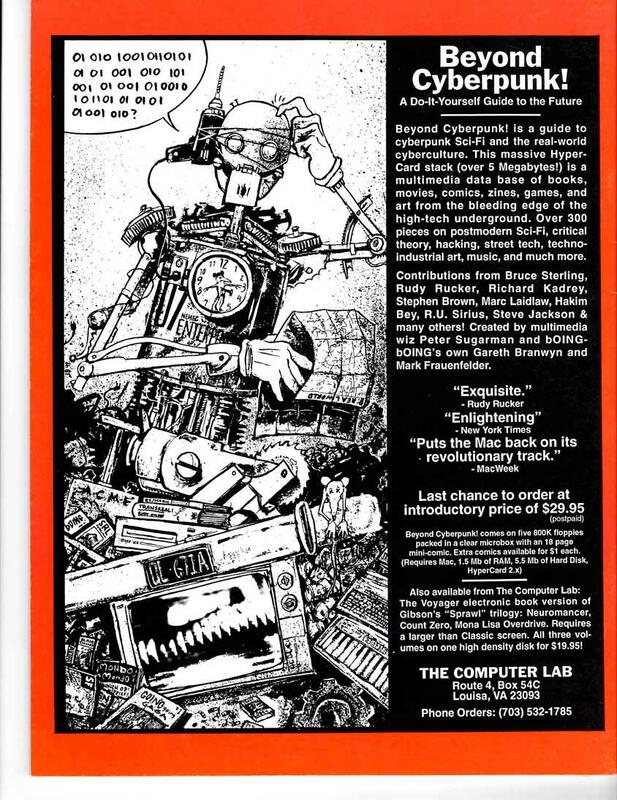 MacWeek claimed that BCP “put the Mac back on its revolutionary track.” It was also mentioned in a cyberpunk cover story that Time magazine did. In November, 1993, University of Iowa professor and sci-fi scholar Brooks Landon published a lengthy essay on Beyond Cyberpunk! in Science-Fiction Studies (Vol. 20, No. 3), arguing that it was one of the more important documents in “the first generation of canonical hypertexts." Other tech journalists and writers who praised it included David Pogue, Adam Angst, Ric Ford, and cyberpunk founding father Rudy Rucker. But despite all of the positive press and wild enthusiasm from early purchasers and a few influential people, BCP never found a wide audience. We invested thousands of hours of work and thousands of our own dollars into it. The critics loved it, but ultimately, BCP bombed at the box office. The program itself wasn't the problem, it was the ugly specter of exposure and distribution that still plagues many DIY projects today. We can only imagine how things might've been different if we'd hooked up with a software company, or even a small, aggressive distributor. But, as with many such labors-of-love, the real riches gained are not measured in dollars or units sold. We made tremendous connections and friendships that continue today. Creator of the web, Tim Berners-Lee, once defined the web as “a universe of interconnected hypermedia documents.” Several years before the web would make its official debut, Beyond Cyberpunk! was like a web on an individual's desktop, with HyperCard as the browser. Working on BCP was one of the happiest times of my life. The entire team gained valuable experience and exposure for our ideas. We ended up in major media venues and got work opportunities out of it. We built significant parts of our careers on the project. It was partially because of my knowledge of hypermedia through BCP that, in 1993, I was asked by Ventana Press to write the first book about the web (Mosaic Quick Tour: Accessing and Navigating the World Wide Web). Seriously? The future – YOU'RE SOAKING IN IT!